Documentation, Forms and Proofs on Fire. ... Better off on "File"; Protect the contents and integrity of your work using this clear approach, and create a backup copy in case of unexpected loss. Fire up your laptop, digital camera and a flash drive so that we can get to work organizing, saving and taking steps to preserve all of your genealogy work. In performing your genealogy work don't lose sight of the fact that you're re-assembling and recording history. If your work is not periodically organized, saved, backed up and duplicated the potential for eventual loss is very high. In this article we'll discuss ways that you can gather and organize your materials effectively. Further, we'll explain how to do this in a way that makes your work both easily and enjoyably presentable to others. 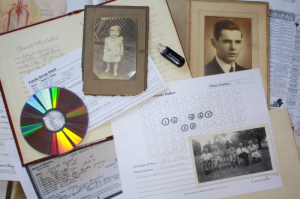 Here are some ideas to help organize and archive your genealogy materials to ensure they will be available for future generations to enjoy. The first item on the agenda is organizing your genealogy materials. The goal is to both organize and present the information in a way that will be clear and enjoyable for anyone to look through. I suggest beginning with family segments that are easily separable. My files are divided in eight parts. I keep a separate family file segment for each of my four grandparents and my wife's grandparents. The physical copies of genealogical information are contained in a separate binder for each family. Materials in all of the binders are arranged in a specific order being, general information, individual files and then photographs. The first flap contains a printout of the particular family tree section along with a family story, genealogy timeline or photo of the family if available. This material provides a nice introduction to the family featured in that binder. In my books, I include a list of what work I plan to do next so that I or someone else can easily pick up where I left off. Note that each individual in the family tree chart should be numbered, which helps with the next step. If you're using family tree software this may be done for you and if not you'll need to number each individual. In the second section of the binder are individual records, all contained in sheet protectors separated with dividers or index sheets with each individual's number and name listed on it. This section contains only the paper records for the individual such as their individual data sheet, copies of genealogical documents and proof sheets for verification of facts. Sheet protectors will easily hold four sheets of paper or more but don't be afraid to add more pages. This individual record does not have to "display" each item. The main priority is to group the material together so it can be taken out and actually examined when desired. I usually try to use the clearest and most interesting documents facing out and visible. Organizing photographs is a task deserving its own attention. While there are several photos of individuals that could be included in the paper record section of the binder, photos grouped together are far more interesting to look at and compare. If you have only a few photos of a particular family then it will be best to include them in the same binder along with the rest of the records. If you have enough to warrant a new binder, be sure to label each binder clearly to indicate which information binder matches up with it. Arrange the photos as best you can, in chronological order from most recent to the oldest. Each photo should be numbered and then labeled with as much information as possible. A genealogy archive photo index sheet that can be found at Geneosity.com will be very useful for identifying and labeling every individual. Next go back to the paper record file divider for each individual and write on them which photos include that person. Electronic versions of each binder should be kept as well. On my computer I organize files exactly the same way. I keep a separate folder for each family group, and in that folder I have general information files pertaining to the family, along with individual sub-folders for individuals and photos. The individual file sub-folders include scans or electronic photocopies of each paper document from the binder. My archive photo index sheets are also scanned and saved in the photo sub-folder, using the same name as the photo plus the word "index". A Jones family photo that might be saved as "jonesfamily1920.jpg" has a corresponding index sheet named "jonesfamily1920index". It is then inexpensive to burn a CD or copy a disk or other memory device to contain this folder's contents, where I then drop it into a sleeve in the corresponding binder. When I lend out the binder to someone they can copy the contents of the binder directly to their own computer. As more and more family members make copies of their own, the safer this information is from eventual loss. We discussed the practice of keeping several CDs in each book at a local genealogical society meeting and a member suggested adding a note card to the CD jacket. Like a library book, as someone takes a copy for themselves they add their name and information to the note card. That way it's always listed in the back of the binder who might be in possession of an electronic copy. If one day all of the CDs have been taken and the original creator has moved on there will be a way to locate one. I thought this was a fabulous idea and I highly recommend it. There is one individual in my paternal line that we discovered has the boxes of old records and pictures that belonged to my great-grandmother who lived from 1865 to 1945. She passed over sixty-five years ago and so dozens of descendants from her family have lived and died without knowing about or seeing what was in those boxes. Knowing ahead of time I'll never get to keep anything much less borrow it (they won't let it out of their sight), I need to make quick work of getting copies during a two-hour time period. In my work I will copy and photograph all that I can of those pictures and records, and then create duplicate copies for inclusion in my binders and computer files. The pictures taken of photos won't be as good as having the original but you'll be amazed how well they can turn out. Your camera can be the most useful device in your genealogical work, and save hours of time. Pictured is a milk crate holding about thirty-five POUNDS of material. As the appointed historian of this family it's my job to save and archive the material in these old binders. The binders contain documentation, meeting notes and photographs for each annual family reunion starting in 1931. This is the most incredible collection of chronological materials I have ever seen. Problem: The books are falling apart and the contents of the pages are very old and much of it is brittle. The binder pages are too large to fit my 8.5 x 12" scanner and some of the bindings wouldn't allow me to open them flat without damaging the books. Some of the materials in the pages are too delicate to remove without fear of damaging them. Solution: I have opened each page and added a label to the bottom identifying which book and page it was. Using my digital camera I photographed each page. With the protective film over the pages, sometimes I needed to take my picture at an angle to reduce the glare. By taking the pictures at the highest resolution of my camera I'm able to view each picture and zoom in to a level of detail that allows me to read every word and view every picture quite well. Once this was completed, I began taking the old books apart. By cutting off the flap and binder section of each page (leaving the original protective film undisturbed), each page now fits nicely into an 11.5 x 12" archive-quality sheet protector and snaps into a binder-style album. Each album contains several CDs in a packet, which contains images of each page so that family members can take copies with them from future reunions. These books are a collection of information all their own, but I have taken pages containing pertinent information about individuals in my original eight binders and added them to my personal records. Another electronic storage option that is inexpensive and much faster than creating CDs is the flash drive. For under $10 you can buy an 8GB USB flash drive which will hold at least 600 pictures and scanned images plus your documents, reports and your entire .ged family file. They can't replace the CDs in each book and shouldn't be intended to, but rather to create another backup of your computer files. Copying everything to a flash drive takes only minutes and you can store it or carry it with you anywhere. In my experience I have seen cardboard boxes, shoeboxes, folders, binder books, old books and even cluttered drawers containing generations of family history information. Under these conditions, the material is difficult to sort through and makes an unorganized mess of new research. If you try the organization project proposed in this article you'll find your work to be more enjoyable and you will save the precious time of having to look for something you once had. I've done it and so has everyone else, but I won't go back to the shoebox method ever again.